Nowadays, our world is hit by early infantile autism epidemics. Every 20 minutes a new case of autism is detected in the world. 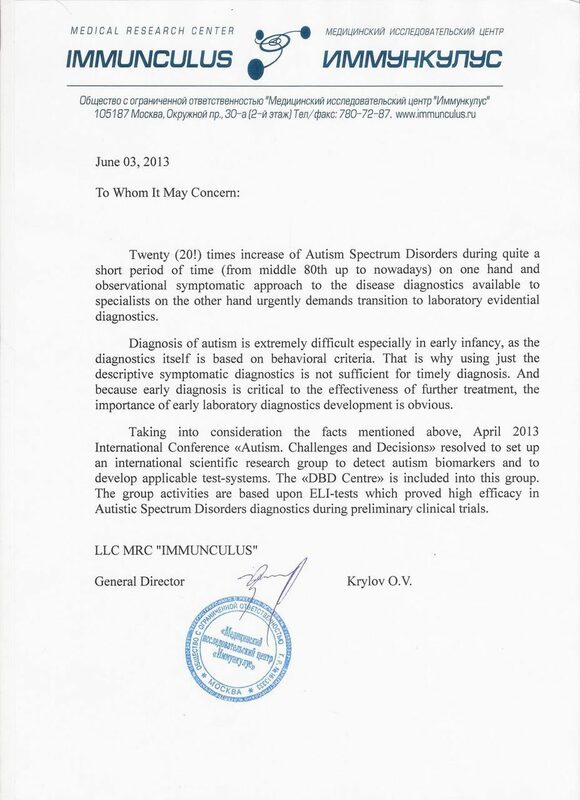 Unfortunately, there is no laboratory proved diagnostics of autism. We are willing to develop the test-system that enables detecting autism easily and accurately by means of just one blood test. Nowadays, autism diagnostics is based the symptoms description. But such diagnostics is neither accurate nor timely. Our latest test-systems enable accurate and timely autism diagnosing and, as a result, starting behavioural correction as early as possible. «DBD Centre» is an integral part of an international scientific group that is researching bio-markers of autism and developing diagnostic test-systems. The Centre specific task is conducting clinical trial doing ELI-tests for patients with autism. 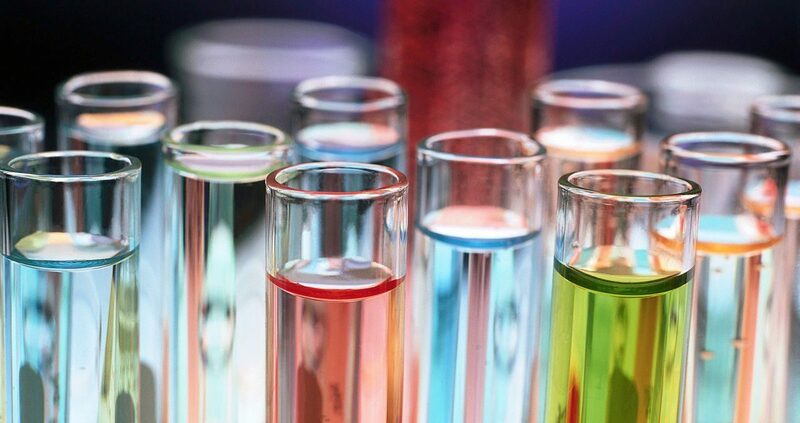 Within our project we use the latest unique test-systems, so-called ELI-tests, which enable revealing biomarkers of various diseases at a very early stage, even when disease symptoms are not present yet. How do we plan to work with the new test? If autism is suspected the patient is referred to laboratory blood sampling. Just 1 ml of blood is needed for conducting autism diagnostics by means of the test-systems in process. The test is carried out using standard ELISA equipment that is available at any laboratory. The results of the test are processed by a special computer program. Clinician receives the results in the form of a chart where all the cerebrum structures alterations are clearly seen, thus confirming or denying autism. The very first trials of our pilot test-systems showed their efficacy in autism detection, the fact was made public at the April 2013 International Conference “Autism. Challenges and Decisions”. However, the research has just been started, not everything is quite clear and both test-systems and results interpretation are to be improved. How will autistic patients benefit from our research? As a matter of fact, symptoms of autism normally declare themselves at the age of 2.5 years. At that period the child may make an impression of a spoilt and naughty terror. Detecting autism in such a child relying purely on one's behaviour represents serious complexity and often causes difficulties to doctor. On one hand, one can underestimate behavioural symptoms and be late with autism correction which is vital for autistic children, on the other hand, one can overestimate the child's behaviour and mistakenly put the child on autistic list. That is why our project – autism laboratory diagnostics – will guarantee the accuracy of the diagnosis and appropriateness of the chosen treatment. This will help in the diagnosis of millions of young children and teenagers whether or not they have autism. In complicated cases where the physician is unsure of an accurate diagnosis this test will help determine or eliminate the presence of autism in the patient. It is obvious that not just patients will benefit from our project, but also those who are concerned with them, those who cares about them. First of all their families. It is well known that the earlier autism is detected, the more successful prescribed treatment turns out, the more fully fledged member of society grows up, relieving the family of lifelong sufferings, grief and financial burden. Our project will enable doctors diagnosing autism accurately and in due time, and, so, prescribing timely and proper treatment. Finally, all social care institutions will benefit from our project, as returning to normal life results in reduction or even in termination of spending due to condition improvement or full recovery. Researches in the field of autism are very expensive and can't be carried out without continual financing. We appeal to different government, private and charitable institutions for financial help, as we believe that in the nearest future our project will help millions of children by detecting autism at the earliest stages and timely start behavioural correction. Please do not be indifferent and do not stay aside! Potentially amongst these children you can find your own child, grandchild, niece or nephew!